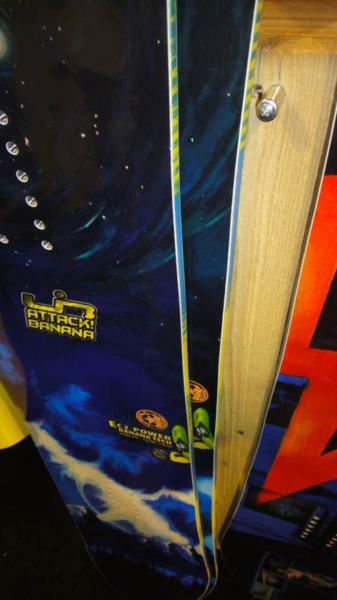 The Lib Tech Attack Banana received a little overhaul shape wise giving it a little more of a directional thing going. It’s still very similar to the older model but seems like it has a little more directional float when setting it all the way back on board. It makes the 2019 model a little better choice for those looking for a one board quiver. The Lib Tech Attack Banana has a unique camber shape called EC2 BTX and it lives somewhere between C2 BTX and BTX. It’s like a combo between the Skate Banana and Gnu Riders Choice but with a much more mellow side cut. It has the loose feeling of the Skate Banana but the stiffer more poppy feel of the Riders Choice with less grip edge hold wise. 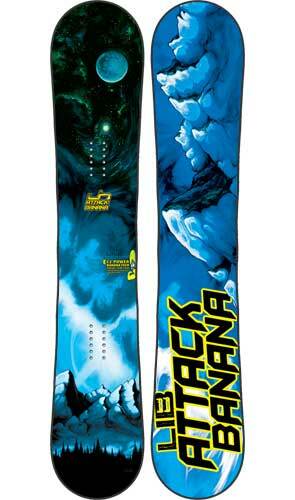 The 2014 Lib Tech Attack Banana added some sizes so there is a 151n for smaller riders and women. The 2015 and 2016 Lib Tech Attack Banana is pretty much the same except for the Art Work. Conditions: Hard to semi-icy snow, a few inches of powder with hard snow underneath and some soft thick snow days. No powder. The Attack Banana is an interesting board. There are 3 boards with Banana in the name and all three are very different. There is the Skate Banana which started it all and is a loose playful park ride. Then there is the Banana Magic which is an aggressive somewhat stable all mountain ride. Then there is the Attack Banana that is in it’s own world. 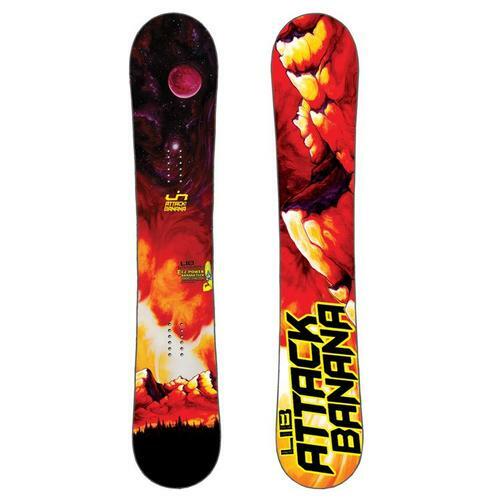 On Snow Feel: The Attack Banana is one of those rides that you would expect to be like the Lib Tech TRS or the Gnu Impossible Series but it’s not at all. Its very loose between the feet and feels like the skate banana here or maybe even a tad more loose. It’s very playful but it feels stiffer than the skate banana. There is a very mellow camber at the tip/tail but it feels pretty loose when one footing or flat basing. For some the on snow feel could be off putting if you are looking for a stable or mostly stable ride. In hard conditions this is really noticeable and in softer conditions it’s a little less noticeable. If you know what you are getting into you might find a very playful all mountain freestyle ride for a slower poppy playful park approach to the mountain. It’s probably one of the more loose hybrid rocker lib tech boards we tried. Powder: Not enough powder here to understand how it works but a 100 day a year rider who I know and respect loves this in the pow. It has a bit of a surfy feel for a twin and also offers a less grippy feel in thicker snow. It seems like this would be a good powder twin for taking a freestyle approach to the mountain on a pow day. It also has quick turn initiation and would be fine in tight spots like trees. Turn Initiation and Carving: Just as easy to get from edge to edge as the Skate Banana but it feels a little different. It’s pretty loose between the feet but making wider turns starts to engage the camber at the tip/tail. When you start to get into a carve you can feel the camber for sure but it’s not as good as some of the other EC2 BTX boards we have tried here. Speed: The Attack Banana has a fast base like all Lib Boards but we felt some chatter at moderate speeds over the varied conditions we rode in. If you want speed there are many other Mervin boards that can out perform the Attack Banana. It felt like a skate board with loose trucks at high speed which just isn’t too fun. None of us were really into putting it flat on a straight line. All of us felt the need to constantly keep it on edge at higher speeds to eliminate that wobbly feel. Uneven Terrain: The Attack Banana handles bumpy terrain without issueand isn’t bad here at the end of a crowded rutted up Saturday. It turns really easy through moguls and emerging moguls. Approximate Weight: Like all Mervin boards they are well built and very reliable but this happens at an increase in weight. It’s still nothing terrible and feels a bit on the heavy side of normal. Edge Hold: The Attack Banana seems to have one of the most mellow MTX side cuts of any board out there. I felt a few slips in the icy morning patches but still liked the grip of this ride. 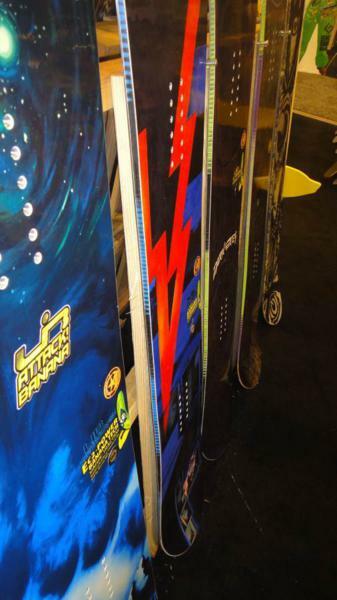 It can handle softer snow better than the more aggressive side cuts and not act overly grippy. It makes this a good board for sticky wet thick snow. Flex: Closer to the softer side of medium. I was surprised at how it did not press or butter anywhere close to the Skate Banana. Switch: This is a twin so it was just as easy to ride switch as it was regular. Jibbing– Not as ideal as we thought it would be. The Skate Banana was much better here. It’s still a Mervin board and they are pretty multi purpose so it’s not terrible. Pipe: On one day I rode this myself I spent a lot of time in the pipe on this board. The day before I rode a board that rocked the pipe so it was not as much fun to ride throughout the pipe as the day before. The loose feel between the feel and the less than excellent edge hold made the Attack Banana ride the pipe adequately. As the pipe got soft my confidence went up but the first few passes on the icy walls in the morning were not that much fun as boards like the Banana Magic and TRS. Jumps: The Attack Banana has a good amount of pop and it was easy to generate your own air. There are a few boards that offer more pop but not many. Hitting small to medium kickers was much more fun than the pipe and all of us liked to slow down on this board and look for natural terrain to spring off of. All in all I had a hard time trying to figure out who the Attack Banana would be for. It’s got pop and playfulness but not that stable all mountain freestyle ride than many hybrid rocker boards do from Mervin’s line. So if you can live with the loose feel for an all mountain freestyle board the pop and twin powder prowess might be worth it. A quick Look at the 2013 Lib Tech Attack Banana. A quick Look at the 2012 Lib Tech Attack Banana. We try to get as many images of the Lib Tech Attack Banana, but forgive us if they're not all there. 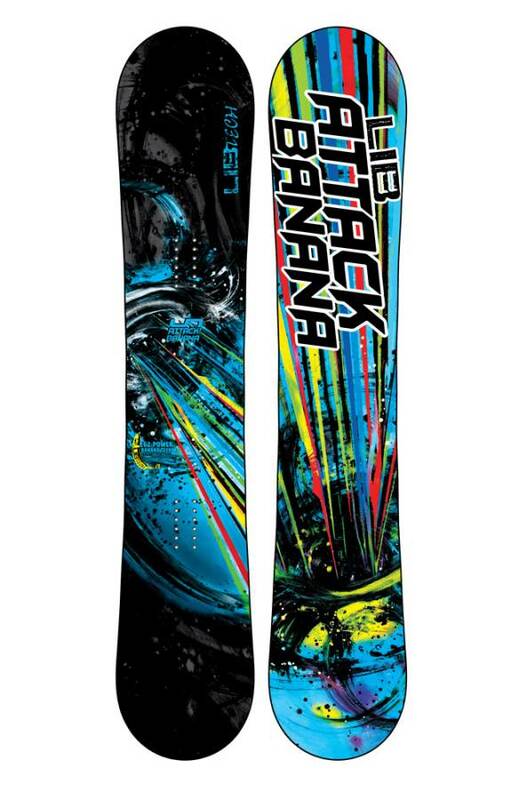 2015 attack banana with top of the line Union bindings. This board is not the slightest bit playful it’s got 0 pop and initiating turns is difficult. This board was a huge disappointment in every way. I didn’t realize how terrible it was until I bought a new Capita Scott Stevens. Basically if you ever plan to leave the park or ride at a speed above a turtle pace avoid this board. It’s terrible in deep snow and no matter how far back you set your bindings it feels like you’re going over the nose and I have a few times. I have the 2015 156W which has the 0.5 magne-traction(wish it had full) Also have GNU riders choice, trice goldmember, and several older stiff camber boards. This is my medium- small mountain go to board. I have added the Attack Banana EC2 165 2018 recently to my quiver which already contains BTX, C1, C2 and XC2 boards from Mervin. I expected to get a one-for-all board and I can say, the Attack delivers. I carves very well and with speed, it turns easily and quickly, it is stable yet loose and playfull, it does a decent job in pow and it has so much pop. In fact jumps are a pleasure with the Attack Banana. It is extremely reliable here. What is does not so well is buttering due to its stiffness. Compared to my BTX (Gnu Pickle) the AB is fairly stiff. But as already mentioned in a review below you can butter with putting some more pressure onto the board. It just needs some more muscle work. So in summary for me the AB is a perfect one quiver board for the guy who is looking for a stable and indeed not too slow all mountain ride but wants to play around on the mountain as well. Somebody who will use the full resort on and off piste and likes to add some spins and jumps to his turns. 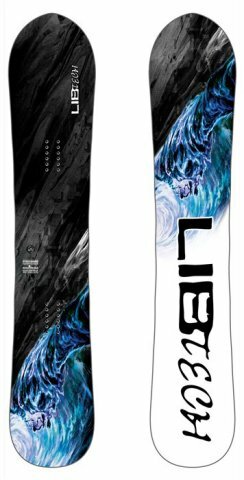 So if you are more about racing down the mountain as fast as possible, this wouldn't be the ideal board , but if you like popping off natural features , slaying pow in the trees and have a more fun loving freestyle approach to the mountain this board is sick! I have a similar experiance to the other reviewer david. 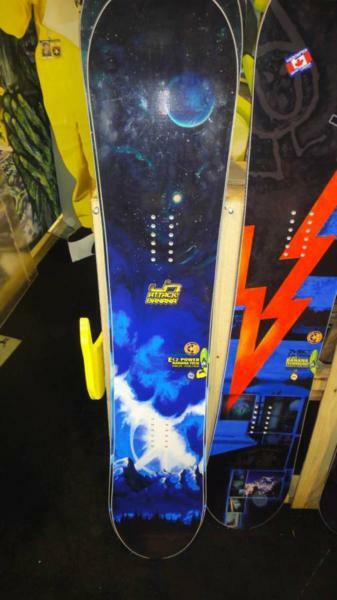 with alot of people telling me how great magna traction is i also had high hopes for this board. Its a playful board to mess around with and good edge hold like i expected but its too loose to ride the board with any speed. I got the ski tracks app so i know how fast i was riding and couldnt push this board past 35mph on my fastest run. 30 mph was my limit for most of my runs and still fealt like i was gonna yard sale any second. Im also comming from an all camber board but i tryed to push this board last season and ended up in first aid. So im going to be parting with it. The only thing i can think this board is good for is a beginner who rides really slow or if your spending you whole day in the park as it spins really well and is buttery. Model: 2013 / 156 Me: 173 lbs, 5'10', Skills: advanced: This is a great all around board. Well made in the US. Cool graphics. Loose and a lot of fun. Forgiving on landings... even when you think you are going wreck. It did everything I asked it to do (great in pow), except... it's squarely/unstable when you flat base on packed powder. At first I thought it was me and that I just needed more time on the board, but the more I road it, I found that the reverse camber of the board keeps the edges from engaging. Occasionally an edge would catch and through me off guard. I want to love this board, alas... After thinking about last season, I spent it up on the edges to avoid this squirrliness. As a result, I was not able to bomb hills and keep up with friends even on greens. Other reviews mention this instability. One reviewer mentioned that he was able to learn how to control it. I want to bomb hills... So I've decided to part with it. I picked up a 2013 Yes The Greats 156 to solve this issue.